Networks are growing at a rapid pace and to meet the demands for more data and faster speeds, fiber is being deployed more than ever before. Bigger and faster networks amount to larger risks – making reliable network performance a chief concern. With that in mind, where should you be looking to help ensure the best reliability and performance of your network? Should you be looking closely at application issues? Is it the server typically to blame? While those are possibilities, the dirty little secret to the majority of network performance issues today are caused by contaminated fiber links. Let’s uncover the dirt on how technicians and the industry are involved with this issue, plus look at today’s best practices for fiber inspection. The number of technicians working with fiber is increasing due to the aforementioned demand. Many of these technicians are working with fiber for the first time, yet they are expected to handle and test their fiber deployments as experts. To make matters worse, loss budgets are tighter than ever before and oftentimes surpass what industry standards recommend. Failure to ensure clean fiber end faces results in exceeding loss budgets and permanent damage to the network. While many technicians carry fiber inspection tools and recognize the importance of them, it is still considered a hassle by most technicians. Many of them end up cutting corners and overlooking this essential practice. This is why standards like TIA-588.3 have been revised to encourage best practices for inspecting and cleaning fiber whenever tests are performed. Despite the pain some technicians may feel about the inspection process, today’s technicians cannot afford not to inspect their end faces. That is why Viavi Solutions has championed the “Inspect Before You Connect” practice, which is being implemented throughout the world. Despite its role in the development of the IEC Standard and usage by industry leaders, automated inspection and analysis software are not yet in widespread use across the fiber optic industry. In an effort to enable compliance to the Standard, even when using manual visual inspection equipment alone, IEC and industry leaders are supporting the promotion of fiber handling best practices. 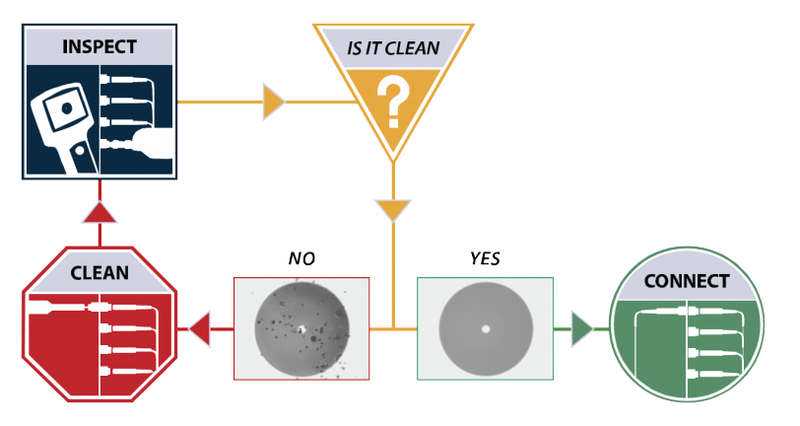 An example of one such educational effort is the proactive inspection model developed and promoted by fiber optic test equipment manufacturer Viavi, “Inspect Before You Connect” (IBYC), as illustrated. The simple four-step IBYC model, which supports and is mandated by the IEC Standard, effectively guides technicians of varying levels of expertise in the proper implementation of systematic proactive inspection. Step 1 Inspect: Use the microscope to inspect the fiber to determine if it is clean or not. If the fiber is dirty, go to Step 2. If the fiber is clean, go to Step 4. Step 2 Clean: If the fiber is dirty, use a cleaning tool to clean the fiber end face. Step 3 Re-Inspect: Use the microscope to re-inspect and confirm the fiber is clean. If the fiber is still dirty, go back to Step 2. If the fiber is clean, go to Step 4. Step 4 Connect: If both the male and female connector end-faces are clean, they are ready to connect. Here’s the bottom line—consistent use of the IBYC model ensures that proactive inspection is performed correctly every time and that fiber optic end faces are clean prior to mating connectors. This simple practice basically eliminates the installation of dirty or damaged fibers into the network, thereby optimizing network performance. Earlier this year, Viavi Solutions released the FiberChek probe microscope that addresses all the key features needed for fast, easy and complete fiber inspection – and it has won some awards along the way. As the number of technicians working with fiber increases, IBYC must not just be recognized as an essential practice, but needs to actually be performed. The FiberChek was designed to make IBYC fast and effective for any technician so that they can ensure the reliability and performance of their network, both today and in the years ahead.